The days of getting a virus and calling a whiz kid to quickly remove it are coming to a close. Viruses, like technology, have evolved into just as nasty of a monster as the Internet itself. Some viruses are easily removable. However, if you are the lucky winner of one of the new types of viruses, get ready to open up your pocketbook if you don’t have a separate backup. Meaning an unplugged or Internet-based backup service – Computer Repair in Miami. The virus, dubbed “cryptolocker,” is nothing to kid about. Imagine someone walking into your house, holding your jewelry box of priceless/expensive family jewels over a molten kiln and saying “If you don’t give me $500, I will drop this box in the kiln, and you will lose your jewels forever.” Well, that’s what the “cryptolocker” virus does in the virtual world with your data. And they are not kidding! Many people have confirmed that their computer no longer functions after calling its bluff, and if they didn’t have a backup, they run the risk of losing everything. What are the next steps I can take to protect my data? Backup, backup, backup. Not only that, some of these viruses will encrypt backups if they are still connected to the computer. This means paying an Internet-based backup company to backup offsite. 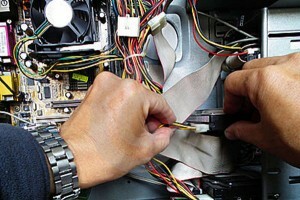 You could also plug the HDD in every time you do a backup, and remove it – Computer Repair in Miami. Do not click on links from emails. I know this is a lot to ask, and most of the links you get in emails are probably all right. But it’s that one email you get that’s not all right that will ruin your day. So at least be aware of the way the email is typed, even if it’s from a friend. Their email may have been compromised, which allows the virus to spread down the line. Watch your website spelling. Some viruses could start by incorrectly typing a web address and clicking the links inside the incorrectly typed address. Consult your IT professional, if you need any type of program, and they will point you in the right direction.